I was quite nervous before traveling to Morocco, especially as I knew I’d only have a carry-on bag. The weather can be extreme from the blazing sun in the cities, to the wind-swept coasts, to the cold nights in the desert. My initial reaction was to pack 5 of everything I could possibly need… but if you’re reading this you know that just isn’t an option. It’s time to get efficient in our packing, to save on plane fares, and to save our backs lugging everything around! Morocco is a hard country to pack for. You need to dress conservatively though the temperature is fierce. 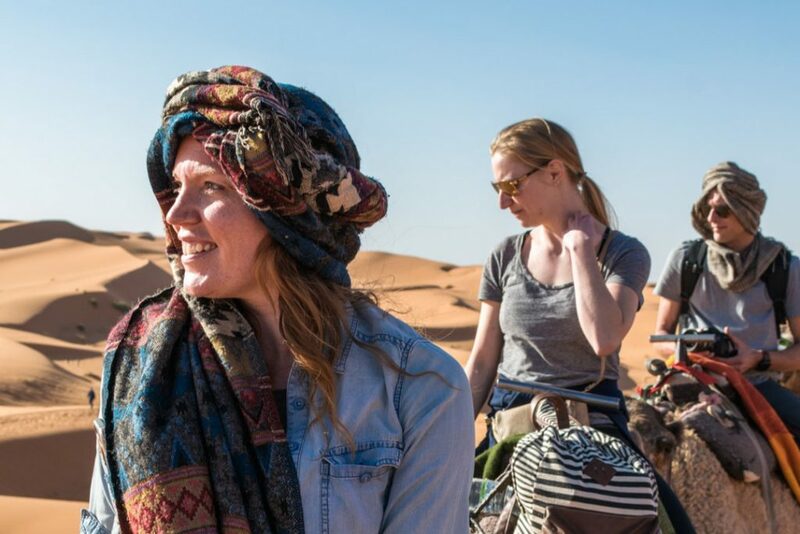 You may need to alter this list if you’re traveling in the summer, but this is what I packed for a 2 week trip to Morocco in early February, when the temperatures were a max of 20℃ // 68℉ degrees during the day, though it felt hotter with the sun. At night it got down to 0℃ // 32℉ degrees. For your reference, the places I traveled to were Marrakech, Essaouira, Casablanca, Fes, the Sahara for an overnight camel trek, Todra Gorge and Aït Ben Haddou. My number one tip is to pack light and durable. There are plenty of stairs in Morocco, hiking your bag up and down them can get old very quickly. If you want to avoid that, porters will often take your bags, but it is courteous to tip extra if your bag is quite large. Your luggage will constantly be in and out of buses and trains so it’s much more convenient to have a small bag you can tuck away. If you do need something extra, there are places to buy essentials, though the prices are heavily inflated for “tourist tax”. 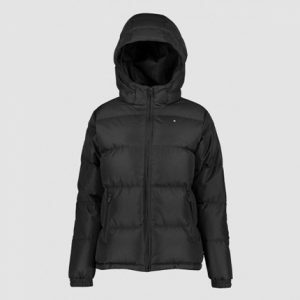 Pack clothes which are easy to wash and dry. They charge a lot to launder your items (220dh = USD$24 for a small load in my experience), so if a few items can be washed yourself by hand it will save you the shock of that bill. I took my Nomatic 20L Travel Pack (expandable to 30L) which they advertise to be suitable for 1-3 days... or 13? You can download a free PDF checklist here, but I recommend you read the details in this post as well! A great thing to keep in mind when choosing what clothes to pack is to lay your clothes out and see if you can wear every top with every bottom. This way, you can create new and effortless combinations. It also comes in handy when you start filling up your laundry bag and are left with limited options. 10 pairs should be enough if you do washing once a week. The amount you take depends on the types of socks you wear. I packed 5 pairs of thin anklet socks and 1 thick pair of hiking socks. 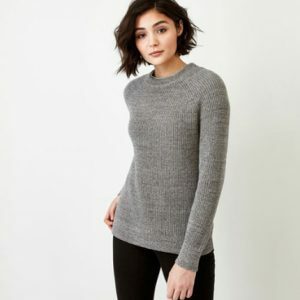 For layering under your other tops for those extra cold nights. 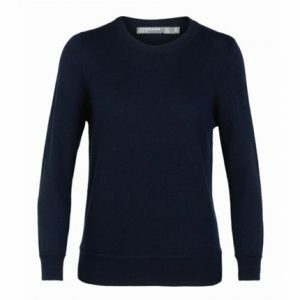 I brought a mix of merino wool tops and cotton 3/4 tops as these are thin, warm and comfortable. 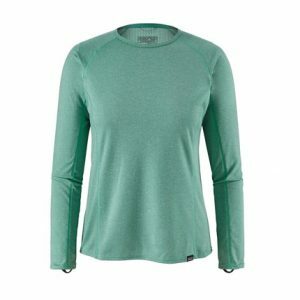 Thermal tops work great for layering. 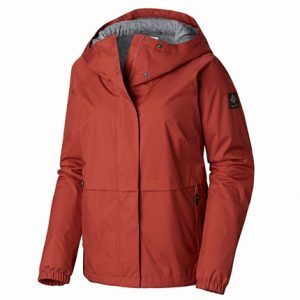 Try Icebreaker, Patagonia, or Under Armour for a more affordable solution. I take my light blue cotton chambray shirt everywhere. It’s easy to dress up or down. Bring two lightweight sweaters which are perfect for layering. 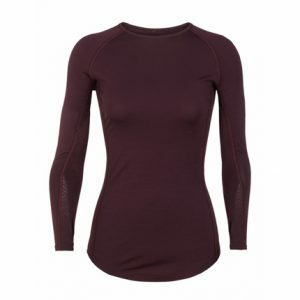 Again, merino is a great option. Cotton generally isn't as warm and wool can be too thick. I was happy to have my thick hoodie to keep me warm on air-conditioned buses and in the Sahara Desert! I love my Roots hoodie! 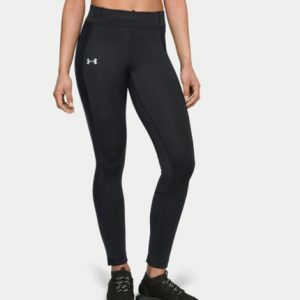 Comfortable black leggings can be worn in the big cities of Morocco. Bring one sportier pair for any activities you may be taking part in like hiking or camel riding. I advise against jeans as they're bulky but if you have room in your bag and are adamant, go ahead! In the more conservative parts of the country, I highly advise wearing loose pants. This is out of respect for the local customs and also to avoid any unwanted attention on your part. If you need pajamas then pack a singlet and thin cotton shorts. Most places have heating so you shouldn't get cold. Otherwise, your loose pants can double for pjs. I bring my Huffer jacket with me everywhere! Columbia also has great options. This came in handy on the cool evenings and in the Sahara. Scarf - A scarf isn't necessary but I brought mine and used it a couple of times, mostly as a headscarf on my camel ride and for the cool winds in Essaouira. I take my 100% yak wool scarf with me everywhere. Love your melon also has a cute range. Sunglasses – I didn’t bring these but I wish I had. Collapsible backpack for day use - So you don't need to lug your main pack around everywhere. Sea to Summit has a great range of lightweight bags. Sneakers – Ones you can walk in all day. Flip flops – For showers and short walks. If you’re not staying in hostels you may be able to skip bringing the flip flops. 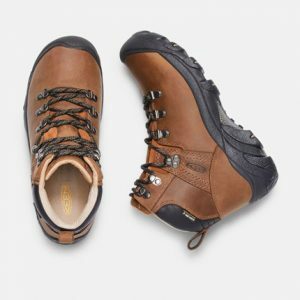 Hiking Boots/Waterproof Boots – I nearly didn’t bring mine but decided to at the last minute. 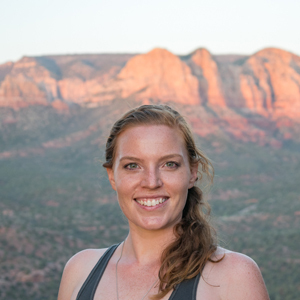 I was SO thankful I did as my sneakers got ruined throughout the journey and I ended up wearing my hiking boots every day. If you plan on going out at night, bring a nicer pair but just make sure they’re comfortable. I love my Keen boots! Try and bring these in the smallest containers possible. Preferably plastic over glass as it’s lighter. Try and avoid buying any of these in Morocco as they can be quite expensive! Toiletry Bag – I didn’t have one lightweight enough so used a thick ziplock bag. Makeup – I only brought Mascara. This is a personal preference and depends on how much room you have spare. I don't encourage you to wear a lot of make-up as you don't want to draw unwanted attention. Deodorant – The very small travel sticks last 3-4 weeks. Sunscreen - Under 100mL of course. You may not think you need it in winter but the African sun is still very strong. Cotton Ear Buds - Only as many as you will need. Tissues – One small packet. Hairbrush - Small fold up comb. Argan hair oil - Buy the real stuff there! Pads, Tampons or preferably a Diva Cup - only as many as you will need. Shampoo – I usually double this as soap so I don’t have to deal with a messy soap bar. Other Health: Antihistamines, Paracetamol, Ibuprofen, birth control, period pain medication, your personal medications. Dirty Laundry Bag - A very thin lightweight bag. Sea to Summit has a great range of lightweight bags. Packable Bag – A really compact bag comes in handy for so many situations - check out Sea to Summits range. Trtl Neck Pillow - The only next pillow I'll ever bother with. Read my review on the Trtl neck pillow here. Ziplock bags – A few small ones usually come in handy. Eye Mask and Ear Plugs – For obvious reasons. I bring the earplugs that are connected to each other as they’re easier to keep track of. Camera accessories: charger, memory cards, lenses - I wasn't unable to bring my tripod. You may need to make sacrifices if you have more camera gear you want to bring. Optional. Ipad or Tablet – This isn’t necessary but I actually brought my laptop with me. Power Adapter – Bring an all country adapter with a plug inlet and USB inlets so you can charge your phone and camera at the same time. Is there anything I missed? What are your essentials for traveling to Morocco? Please leave a comment below. booking.com has over 10,600 properties in Morocco including hotels, apartments, and hostels. You get free cancellation on most rooms and a best price guarantee.